If we are lucky, we have warmth in the day, but the nights can still be cold. As our ancestors recognised, it is a month that can easily turn back into winter. If I look at the past few weeks, the day temps have been up in the high teens, but the nights have been down almost to zero on some occasions. If you recognise that this is quite a large margin of difference, then you will realise just how remarkable plants are. Then you have the rain, hail and frosts to contend with too. All this proves that the soil is still not very warm - hence the old custom of putting your bare elbow or perhaps your bare bottom on the soil, to see if it is ready for some of the more delicate plants. Some plants like Cymbidium orchids need a few cold days to help them flower, but a frost is definitely a no-no. I am quite often frustrated by the weather news on the TV or internet as it is massively generalized to cover several hundred square miles - although I must admit they have got better in recent years. Once, in the middle of the last decade, whilst living in Norfolk, the weather girl reported it was going to be a lovely dry night, yet outside my window some 20 miles from her studio, the rain was hammering down. Did I see a hint of embarrassment on the poor girls face? In those days, my obsessive temperament noted they had only got it accurate on 15 days in the entire year. Which is better than a soothsayer I suppose. But of course for you at home, there are ways of telling if the air and soil is warm enough and what the weather may bring for yourself. 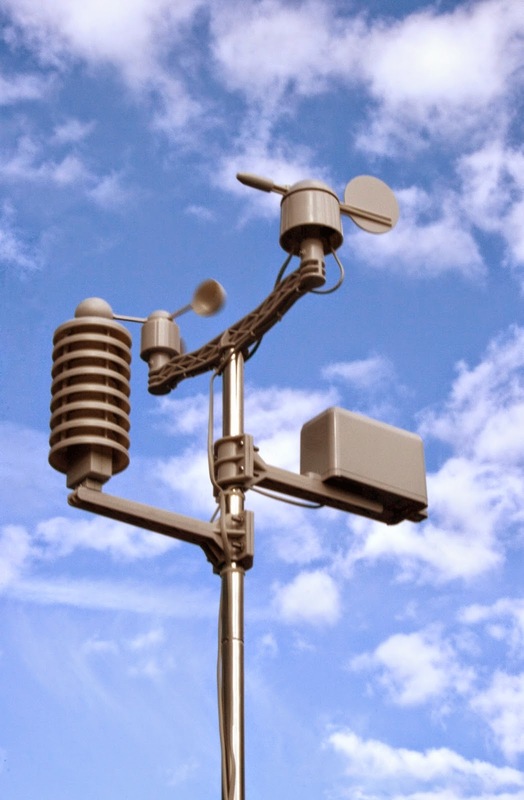 Buy a weather station. With a glance you can tell if the air has been chilled to uncomfortable levels overnight whilst you were tucked up in bed with Gardeners World. You can also have an inkling of what the weather is threatening to do with a barometer as your guide. If you are like me and become lost in the green world, a clock will help you realise supper was 2 hrs ago and perhaps the kids need feeding at some point. In truth the UK has a fantastic array of weather and micro-climates from the abhorrently wet, to the surprisingly dry. Do yourself and your plants a favour and get a bit scientific. In my constant search for titbits of perhaps best forgotten garden knowledge, I am constantly reminded of the idea of companion planting. I must profess to having read many, many tomes on the subject, some inspiring, some less so. In fact, if I am honest the Internet is full of websites declaring the virtues of various pairings, but not being one to give up at the first hurdle, I shall endeavour to briefly introduce you to this subject. Firstly, you must understand that this line of horticultural experimentation is not foolproof. Who in their right mind decided that it was a good idea to plant nasturtium next to broad bean in the vain hope that the winged pest that is 'Blackfly' (Aphis fabae) would somehow prefer to live on the former more than the latter? Notwithstanding I persevere to understand the concept that planting one plant betwixt others somehow enriches the growth or eliminates pests and, I must admit, I have had some success. For example, did you know planting onion or leek in alternate rows with carrot, not only deters the dreaded Carrot Root Fly, but also the Onion Root Fly. This process of using scent is a common theme, planting rosemary next to roses apparently deters aphid or the planting of garlic in flower beds offers some protection from insect attack. Another tried and tested companion plant relationship is Brassicas next to a bean. This may at first seem odd, but there is scientific method. Beans hold nitrogen in the soil, brassicas need nitrogen to grow nice healthy leaves. Thus a match made in heaven and you should include in this list spinach and chard. Similarly, the native Americans in their wisdom, used to plant climbing beans with maize. 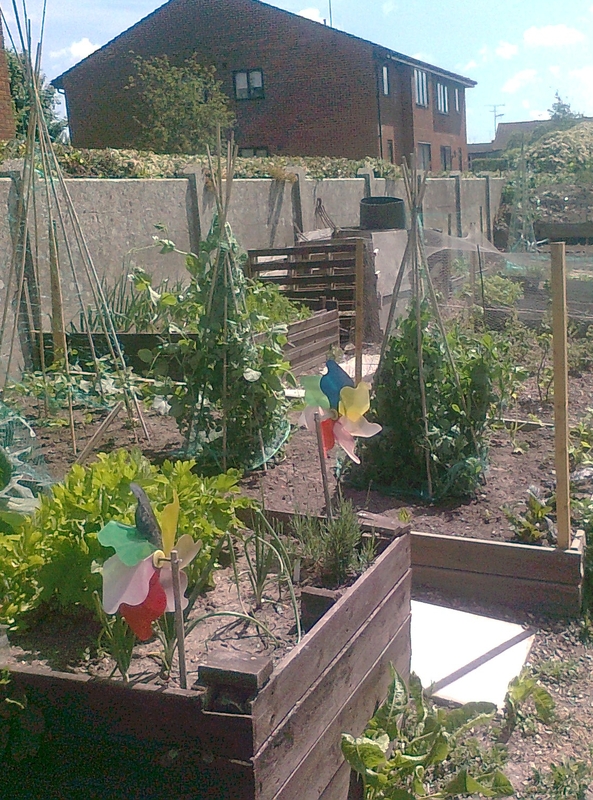 The maize prospered due to the increased nitrogen, the bean gained a free trellis. Finally, chemical warfare is a useful ally in the garden. By this I do not mean expensive and ecologically damaging pesticides. I am of course referring to naturally released oils and hormones. Tagetes, otherwise known as the African marigold, has a useful chemical which has been scientifically proved chemical to ward of soil born insects such as wireworm, so plant them liberally amongst potatoes and other root crop for a bumper harvest. They also provide a food source for beneficial insects such as hoverfly. So next time you look at your planting plan, have a thought for what goes with what and how you can help your garden look after itself. Properly planted hanging baskets are a glorious sight, so it’s a pity that all too often they end up looking like abandoned bird’s nests. A fabulous basket can be yours with a little preparation and lots of easy aftercare. 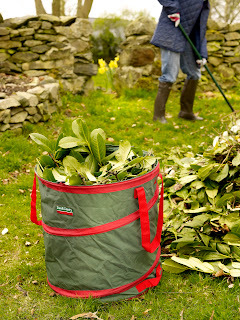 Plant a basket at the beginning of May to give it a fortnight or so to thicken up before hanging it in place. 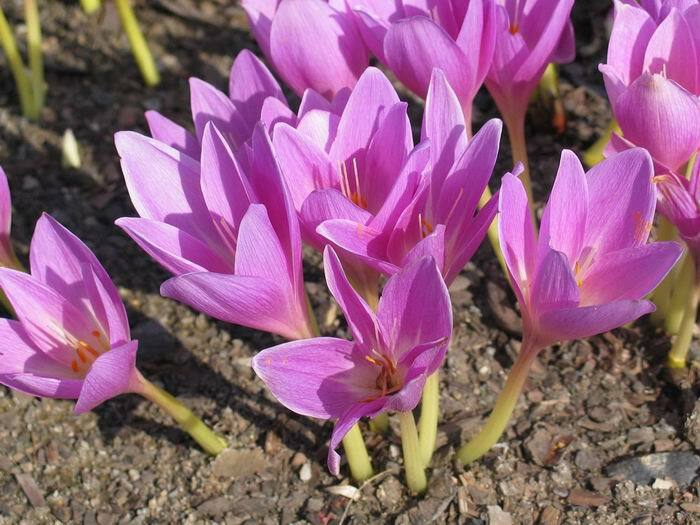 It can be left in a porch or a cold greenhouse or even in a sheltered spot protected with polythene. • Take each of the plants which are to form the first layer, tip it from its container and squeeze the rootball to make it small enough to fit through the basket mesh and liner - you’ll need to push a hole through the liner with your fingers first. Never feed the foliage from inside to outside, always feed roots in from the outside as the plant will suffer less damage. • When the basket is filled to within 2.5cm / 1inch of the top, plant up the top with bushy plants. • Water the basket well and make sure it never dries out. Lack of water is the biggest cause of failure. Once hung in place water every single day! NOTE: Don’t forget to check your brackets and chains before hanging. You don’t want all your hard work unceremoniously dumped in a heap on the path below! These bedding plants come in beautiful trailing varieties. These cast their stems out sideways making them suitable basket toppers. Encourage hedgehogs, frogs, toads and thrushes into your garden to keep snails and slugs at bay. Bird baths are good to attract thrushes. A small garden pond will encourage frogs and toads. Attract hedgehogs by ensuring you have a safe place for them to nest, such as compost heaps, pile of leaves and twigs to nest in. Leave food out for hedgehogs at sunset, don’t put out any earlier or you’ll attract flies laying eggs and always collect anything uneaten in the morning. Hedgehogs like cat and dog food, chopped peanuts, crunchy peanut butter, muesli and any leftover cooked or raw meat. Check anything growing under cloches to ensure it is not too dry and check if they need watering. Air your greenhouse on warm sunny days and open the vents mid-morning and close after lunch. Enjoy your vegetable and salad garden this year, by sowing direct this month carrots, peas, spinach, chard and beetroot. Sow quick growing half-hardy annuals like basil, French beans, sweet corn, squash and pumpkins. April is the month for planting potatoes too. You can get going this month with some salad by sowing undercover or in your greenhouse or conservatory – rocket, spring onions, radish, chard and lots of different variety of lettuces. Keep growing further batches of lettuce, beetroot, peas, spinach, spring onions and radish every 2 weeks so you have a regular supply over the summer. 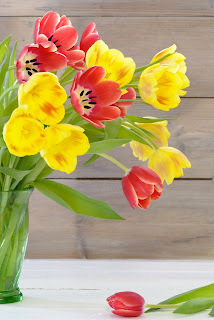 Deadhead larger bulbs such as Tulips, Narcissus, and Hyacinths. Be sure not to cut the foliage! 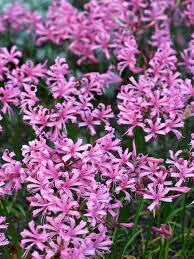 This will encourage bulb development and better flowers next spring. April is the month to get on with planting trees, shrubs, roses, strawberries and perennials. Also get dahlia tubers potted up. Keep on top of weeding. Use hand tools and get down on your knees to pull out the weeds, rather than using chemicals. Aim to get rid of perennial weeds early whilst they are young and their roots can easily be removed before they set to seed. Wearing Town and Country kneepads makes this task comfortable and easy. Containerised plants need plenty of fertiliser and frequent watering, especially during warm weather. After the last chance of frost, (around mid-April but can vary) you can start planting hardier annuals. Start growing your own flowers this month – Marigolds, honeywort and poppies are favourites for me. Seeds can be directly sown outside and any seedlings you’ve been nurturing indoors can be planted out. Tie down roses so that they keep growing healthily and produce good flowers in the summer. Bend over upright stems, this will produce more flowers. If you don’t bend uprights over, you’ll only have a flower at the end. Tie them in so they lie horizontal. Directly sow herbs under cover. Favourites are dill, fennel, coriander, chives and chervil. Give your lavender plants a haircut this month – short back and sides and shape them into domes. It helps them from looking sparse. Don’t prune hard into old wood. Plan for possible water shortages by installing water butts and adding mulch to borders to conserve soil moisture. I really should take notice of this piece of advice myself, rather than making plans to grow enough food to feed a small country. But every January/February brings the sound of seed catalogues dropping on the mat and me grabbing them with excitement, drooling over all the pictures of beautiful healthy vegetables that I obviously need to grow! So I plan all my raised beds (I have six of them, so am very lucky), making sure that I follow the principle of rotating them so that I don’t grow the same thing in the same one each year. I then place my seed order and look forward to the moment they arrive, hoping the weather improves and I can get into the greenhouse and plant them all! So I come back to my piece of advice and the title of this blog - don’t bite off more than you can chew. This year I am planning to utilise only a couple of the raised beds and nurture these rather than failing miserably by doing too much. 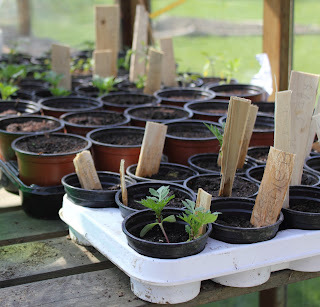 Let’s face it, you don’t need 10 courgette plants or 15 tomato plants and if you feel the need to plant lots of seeds so that you can pick the best ones to plant out, then sell the extra ones outside your house or give them away to friends and relatives. This way you can make sure everything grows healthily and you will not have to try and keep up with the harvesting - usually of one type of vegetable at a time. So choose wisely and enjoy each crop as it comes along without getting stressed!